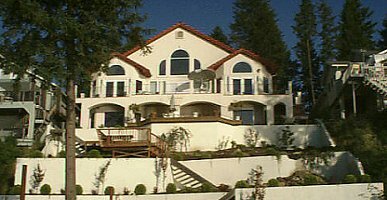 Lakefront luxurious mansion Bed and Breakfast located in a vacation paradise for out-door lovers. With double Jacuzzi Honeymoon Suites, Gas Log Fireplaces, Decks, Breathtaking views, Boat Dock and Grass Beach Volleyball Court. Jet Ski / Golf / Snowmobile / Ski Lodging / Hunting Packages. Ideal for Thanksgiving, Christmas and summer fun. Canoes available. Full breakfast and afternoon refreshments. 33 miles North of Spokane, Washington + 8 miles South of Newport/Idaho Panhandle border.